8 am to 8:30 pm, 7 days a week. 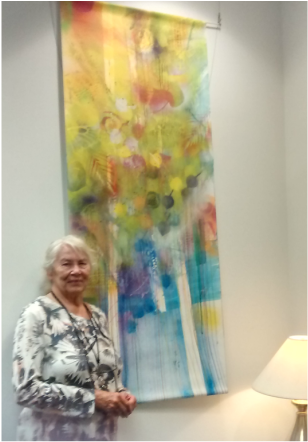 This painting was in the lieutenant governor's office at the State Capitol all summer, thanks fo the folks at 40West Art Center who made this happen. The tour of the capitol is impressive and free. It gives lots of interesting facts and the renovation is beautiful. You can also walk the 99 steps to the dome to see the view. You can enjoy 6 of my medium size watermedia paintings at Pho 2 Love restaurant at 6593 W Colfax Ave, Lakewood at JCRS Shopping Center which is just two blocks from the light rail Lamar Station and is adjacent to the Rocky Mountain College of Art + Design. You can see the menu at http://www.pho2love.com/home.html Everything is good but they make an excellent pho. The smallest bowl is enough for me and I just ordered the kid's bowl and took some home. I usually like the rich Thai tea or Thai coffee for dessert. Join me in the dance.